So I've told you the outline of the course (if you missed it, click here to have a read) now for the inside info! First of all, a lot of you must be thinking, why would a successful mehndi artist go and share all his tips with students? What if we go on to become amazing henna artists and steal all his business? Well, I'll tell you something which might make you look at things a bit differently, first of all, Ash Kumar already has a huuuuge client list, you just need to check out the "gallery" section of the Ash Kumar website to see for yourself some of the famous faces he's worked with! Celebrities aside, if we're looking at normal brides, there are 100s of weddings each weekend during the wedding season (and that's just in the UK! ), even though he's fast, Ash himself said he could fit in 10 brides a week maximum. So as his student, chances are you're not going to be stepping on his toes when you enter the big wide world of henna artistry. His henna products are now widely available online, and guess what? He uses his products to teach the course - so all AK students get to start off their training with AK henna, and a lot of them continue their careers using it! 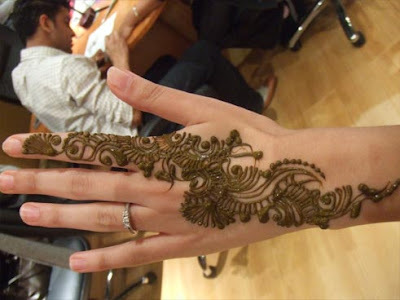 I was really impressed with the Ash Kumar henna, and in fact when I took my complimentary "Bollywood starter kit" home and showed the henna paste I'd just made to my friends and family, they were impressed too. Ok so we've figured out WHY he teaches the course - he's getting the upfront course fee and potentially our loyalty to his henna product, but there's one more REALLY important thing that I picked up in class about Ash: he enjoys teaching! 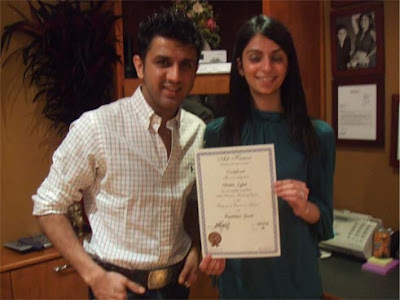 He was enthusiastic from the very start, and he was interested in us - our backgrounds, previous experiences with henna and most importantly, what we wanted to gain from the course. Despite all of this, I left the class at the end of day one feeling a bit lost. The designs I'd produced looked so rubbish! "I'm never going to be good at this" I thought to myself. A week and half passed before it was time to go back for Day Two of the class, and in that time we had homework to do! We had to mix up our own henna paste, take a sample in to show Ash, and draw 4 designs in henna on paper. Day two rolled around and it was nice to see my classmates again. Day two was even more relaxed than day one, with hardly any formal teaching at all. We all had more questions, which Ash was happy to answer, and then he went through our homework one by one and gave us all individual critiques. I'm happy to say he liked my designs!! Then we got our certificates, and finally before we departed, we all got a henna design from the man himself. I left the class on Day Two feeling inspired! I'm not exactly going to go out there and become a professional henna artist, but my friends and family certainly appreciate my new talent, and in the future I could take this further. So...overall, was the Ash Kumar Henna course worth it? Well, I learnt a lot from it, and I did really enjoy the classes! But if you're serious about a career in henna, this course isn't an express line to becoming an expert. After all, this was just the "foundation" class, there's an intermmediate, and expert class and after that if you really want to learn more there's a one-to-one masterclass, all with hefty price tags! I've been practicing a lot since the class and even now I can see my designs improving, so if you really want to make it as a henna artist then courses like this one can only guide you in the right direction, it's your own creativity and dedication that's gonna help you become better. Although I will add, that if you put your money into the Ash Kumar Academy and are willing to work your way through his courses, you'll learn a lot from him about business and probably make some good contacts on the way! So, if you fancy getting your hands on some AK henna to practice with, Non Stop Bazaar have a discount available until 31st March, just use the discount code NSBEaster10 to get 10% off! The Ash Kumar Bollywood Henna kit usually costs £14.99, and for a full range of AK products check out Revel Asia. If you're thinking about enrolling into the Ash Kumar Academy, you can find details on all courses at the Ash Kumar website, and if you've got any questions for me, feel free to leave a comment or send me an email. I didn't know ash kumar was so YOUNG! I wish we had something like this in the u.s. i think there ought to be right? According to the Ash Kumar website his academy is going international with courses in other countries - so it might be worth getting in touch via his site for more info. Aside from that I don't know much about US henna artists but if you know someone who's really good and you want to learn, ask if they'll train you? I was thinking of enrolling, are you going to do the remaining sessions or no? I am thinking of enrolling in one of his courses he's having in Canada. How much experience did you have before you enrolled in his course? I want to enroll in a beginners course...any advice would be greatly appreciated! Ash is training in NYC on Oct!! Im so excited to go and learn from him. Ash - when are you coming to South Africa? I really would love to do the course!! IS THERE AN AGE LIMIT TO DO THE COURSE??? IF SO WHAT IS IT???? When ur nxt course is starting in uk n where? Is it possible to other city? Like sheffield? N makeup course too? can u tell me when ur new course start in pakistan....plz tell me?? ?IS THERE AN AGE LIMIT TO DO THE COURSE?